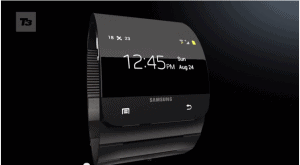 Samsung has not yet released any piece of information on their next device, the Galaxy Gear smartwatch. This created the space for a lot of speculation and rumors, as it happened this time with website T3, that has created their own Galaxy Gear concept and featured it on a video. The video shows how the guys at T3 think the Galaxy Gear will look like and what features it will have. For example they show off how you can us the S Voice feature to control the device, to answer messages and so on. The device in the concept video looks really great, but remember this is all unofficial stuff, so take it as it is. Below you can watch the concept video yourself. Samsung could really make a hit out of this device, especially if the device will look something like in the video. All we know is that on September 4 Samsung will officially reveal the device.